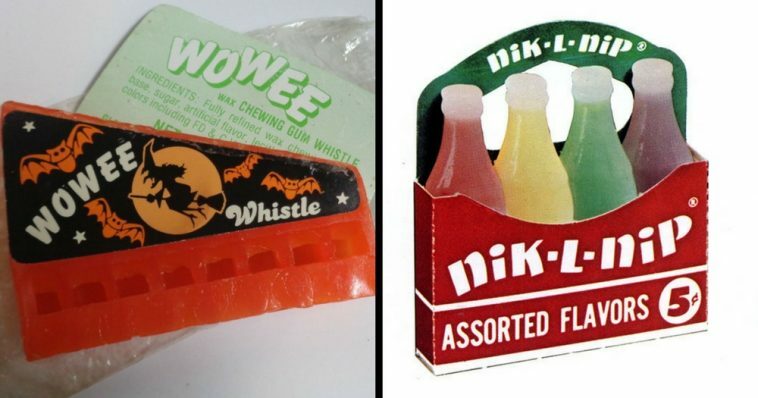 Nik-L-Nip And Other Weird Waxy Candies That Are Sure To Bring Back Memories | Do You Remember? Ah… wax candy. 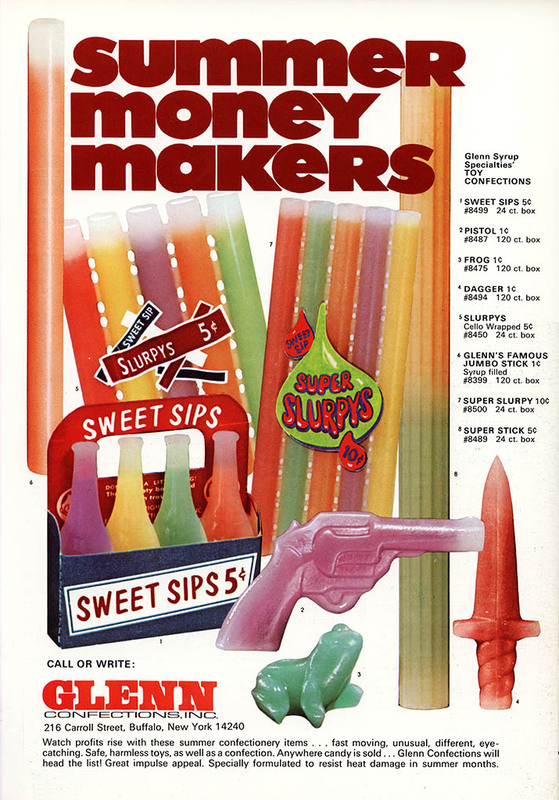 As a kid, I never really understood the appeal, and frankly, I was a bit afraid of the syrupy contents of some of these. 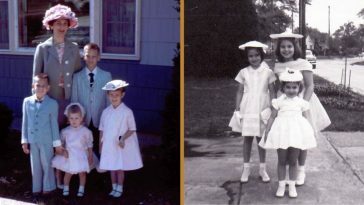 But my friends all seemed to enjoy them, and as I’ve found over the years, they were not alone. 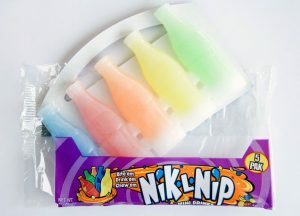 Things like wax lips and Nik-L-Nips are still around today, and still, evoke powerful nostalgic memories for those that had them as kids. 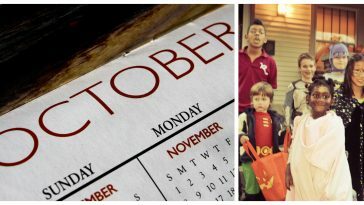 In lieu of Halloween sneaking up on us, We are sharing a series of trade ads and clippings from the early 70’s era. I don’t have much in the way of packaging for any of these wax treats. 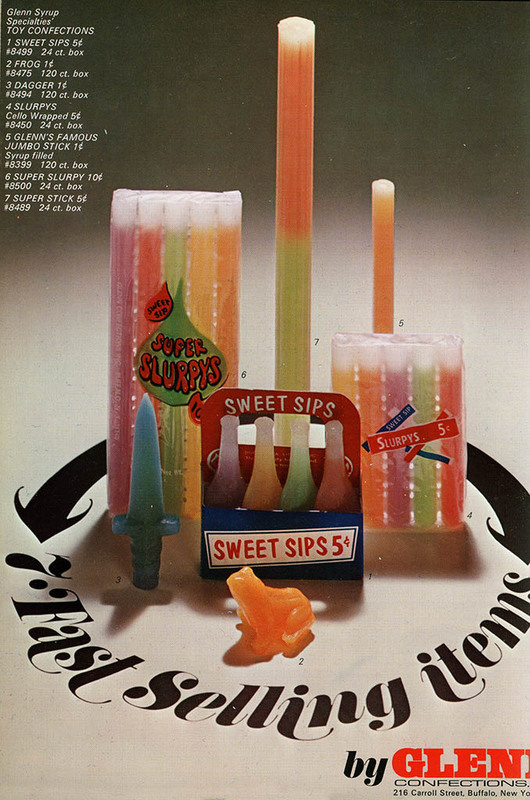 It seems that, for the most part, the packaging was an afterthought (with the exception of Nik-L-Lips) where this category of confection was concerned, and it rarely stood out by itself. 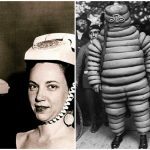 It was the syrup-filled contents that were the stars of the show and the funny looking lips and buck teeth that gave us one new, outlandish look! That was certainly the case in the early 1970’s. 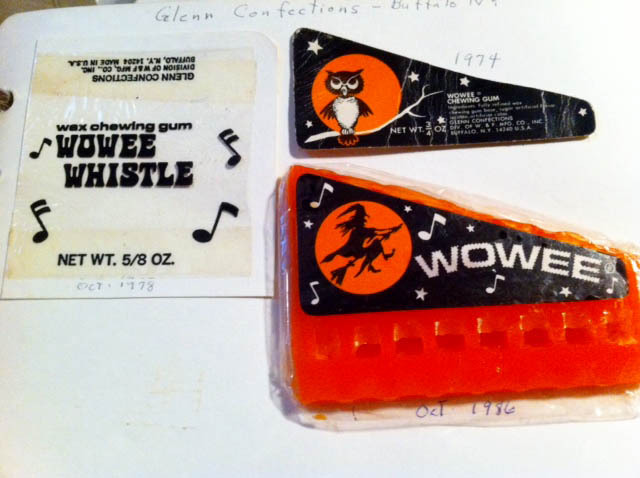 By my estimate, this era was a time of intense competition between two of the biggest wax novelty candy manufacturers; Glenn Confections and W&F Manufacturing. 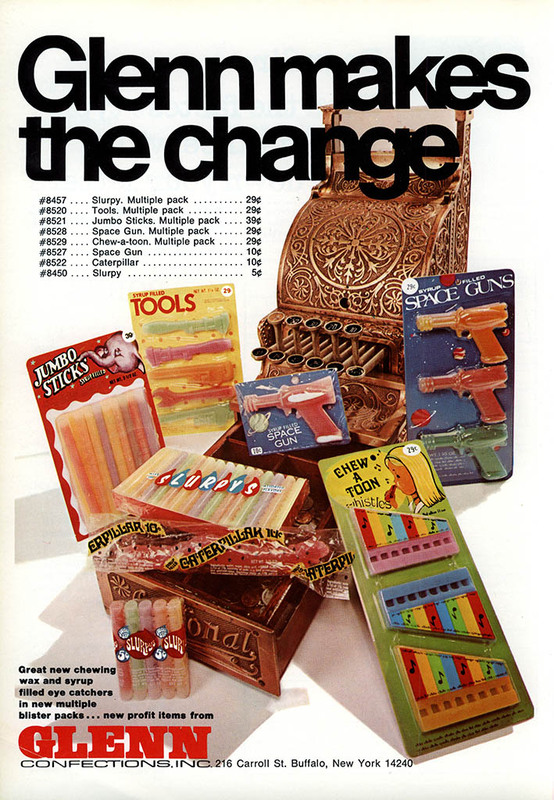 Their ads in the candy trades during this time were full-color and plentiful. 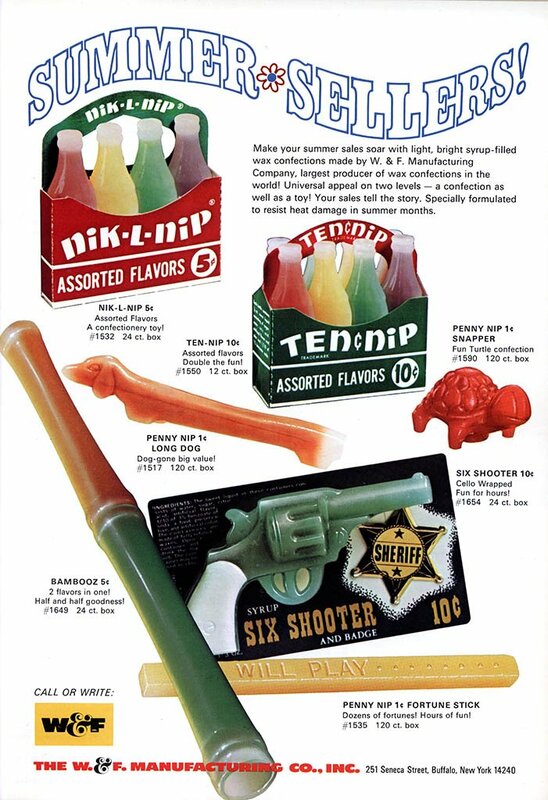 Which is good for us today, as I get to use those ads to show you a nice cross-section of what was available during my youth. 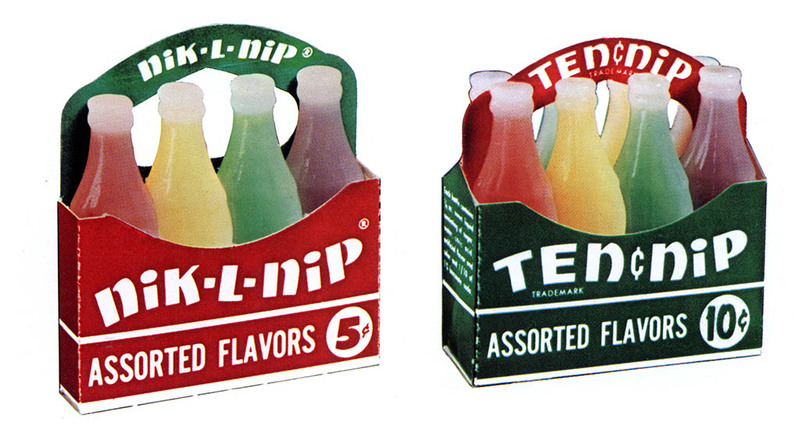 Before I get to those, I’d like to mention Nik-L-Nips, certainly one of the stars of the wax novelty world. 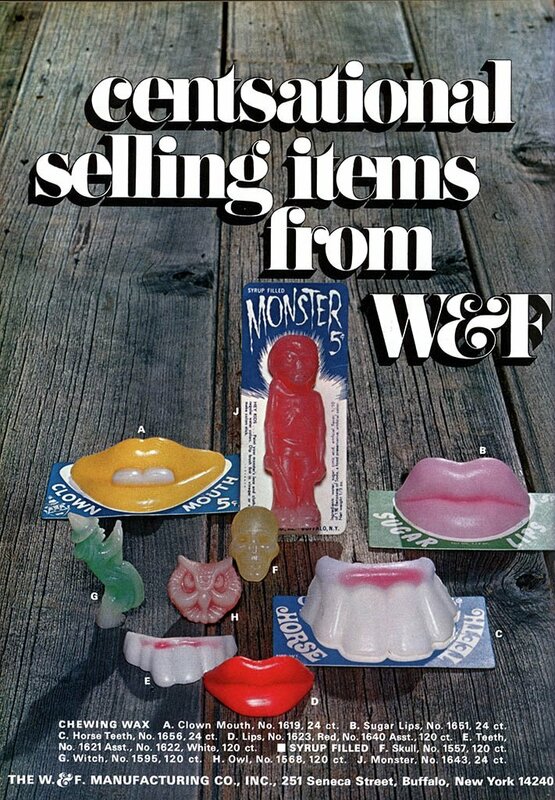 Originally produced by W&F, they’re still around and are now a product of the Tootsie company. 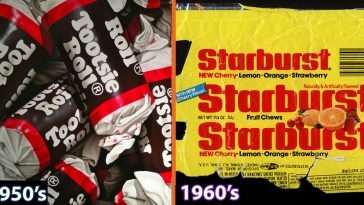 Tootsie has acquired several of these nostalgic brands over the years and has used their confectionery power to allow them to live on, where in some cases they might have disappeared. That’s pretty cool, in my book. 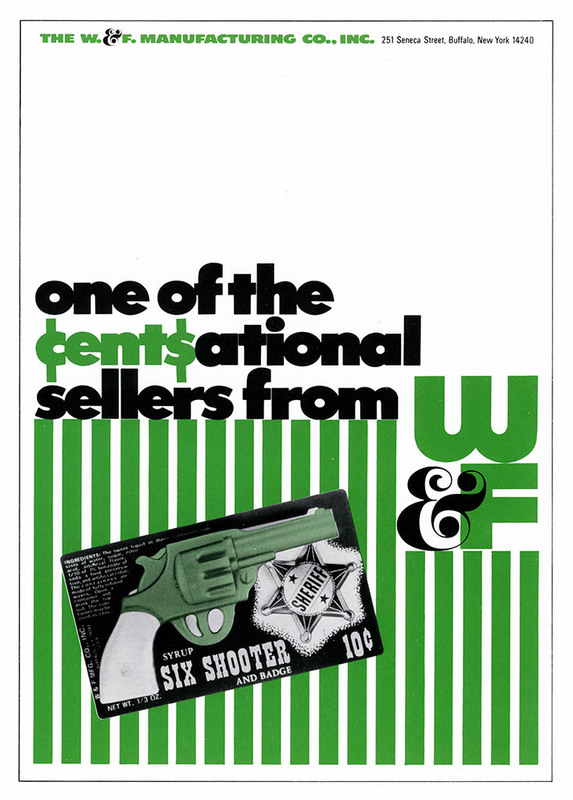 I’m going to start with something you just wouldn’t find today – a wax six-shooter. 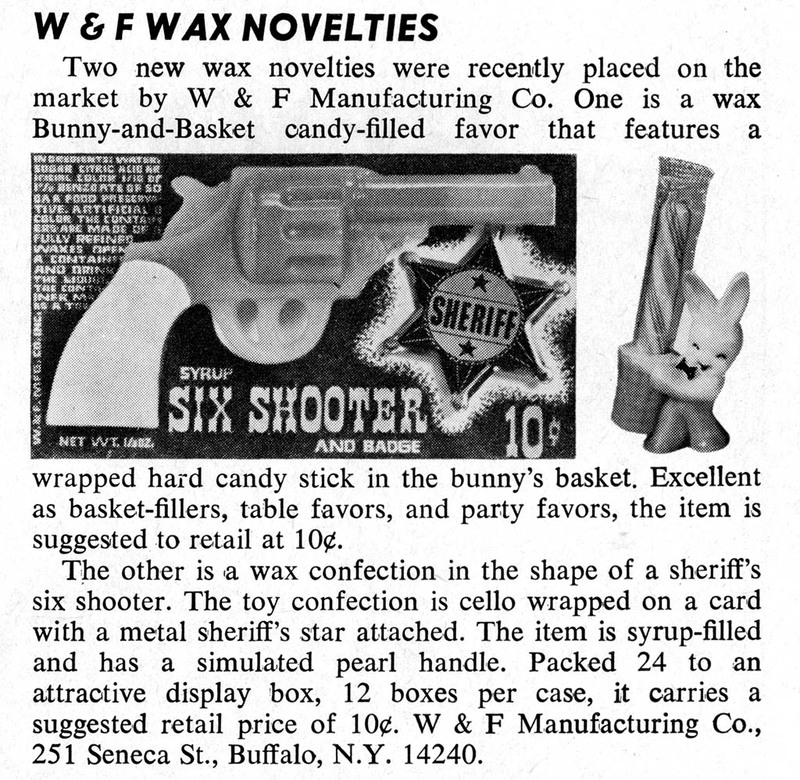 Oh, wax six shooters and bunnies – they really do go together. I don’t think I need to point out the issue some folks would have with the wax six-shooter seen here. 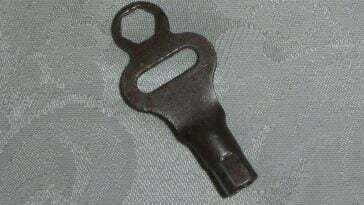 Simpler times. 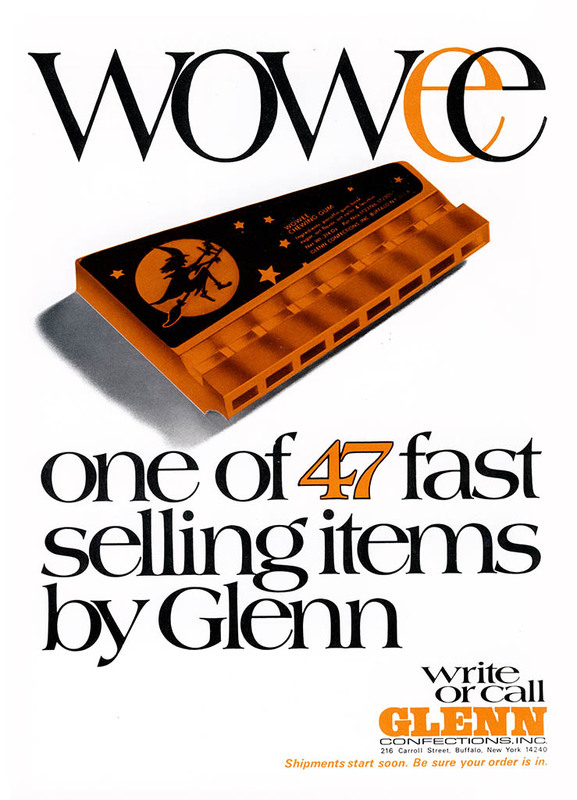 As you can see, Glenn was producing similar items to what W&F was. 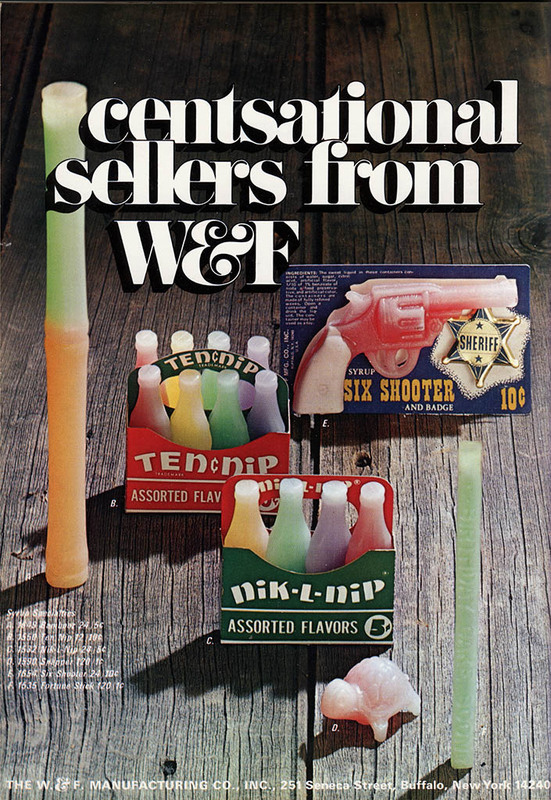 I suppose you can’t trademark filling a wax six shooter with flavored syrup. And once again, a wondrous mix of waxy forms; daggers and frogs. 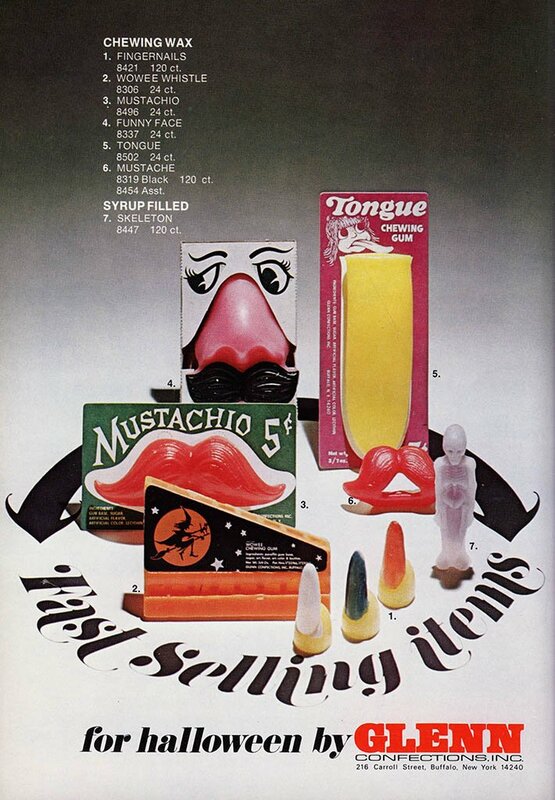 This next ad has some really cool pieces that aren’t included in the other ads: A syrup-filled space shooter, a syrup-filled caterpillar (pretty gross for 1971), syrup-filled tools, and Chew-A-Toon, the same wax gum whistle that would be called Wowee for Halloween. And that’s everything I’ve got to share today on the phenomena that is syrup-filled-wax confections. 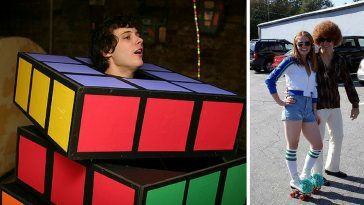 I’ll admit that I still don’t quite understand them, but I can’t argue with their appeal – people do love the things. 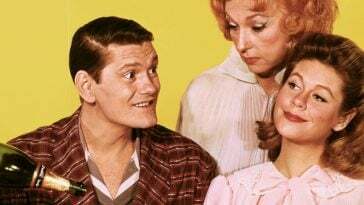 Honestly, I’m still a bit afraid of that syrup.